Jemez mountains in Alcalde a la "Black Mesa Landscape"
We awoke at the Mabel Dodge Luhan House in Taos and headed out towards Santa Fe. 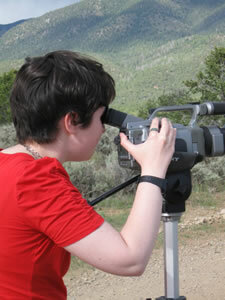 On the way, I stopped to shoot some film of the Rio Grande river and surrounding hills. We also pulled over by Alcalde, the town where Georgia O’Keeffe had stayed on a ranch in her early visits to New Mexico and painted views of the Jemez mountains. 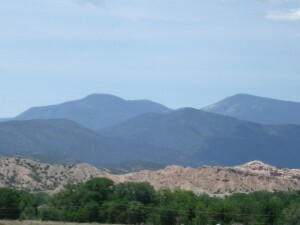 I snapped a photo that shows approximately the same view as her painting “Black Mesa Landscape / Out Back of Marie’s II”. We eventually made our way to Santa Fe and went straight to the “Abstraction” exhibit at the Georgia O’Keeffe Museum (co-organized with the Whitney Museum in New York and the Phillips Collection in Washington, DC), which was wonderful. The textual curation was limited to some interesting quotations from O’Keeffe herself, which shed some light on her attitude towards the art on view. The works spanned the length of her career, from her early minimalist watercolors (see “Black Lines”) to late bronze cast works (see “Abstraction”). The exhibit encompassed “purely” abstract pieces, such as “Music – Pink and Blue II”, as well as works that blend the line between abstract and representational, like “Pelvis Series, Red with Yellow”, the least literal in her group of paintings in which magnified animal bones frame views of the sky. And of course, the exhibit also featured some of O’Keeffe’s abstracted landscapes. I found the series of jack-in-the-pulpit paintings particularly beautiful and interesting, displaying clearly how O’Keeffe would start with a quasi-realistic representation of an isolated subject (see Jack-in-Pulpit – No. 2), and transform it into increasingly abstracted images (see Jack-in-Pulpit – No. 5) , like fantasias on the shapes and colors that she saw in the original subject. After taking in “Abstraction”, I visited the Georgia O’Keeffe Museum Research Center across the street for an appointment with Barbara Buhler Lynes, who was generous enough to take the time to speak with me. Ms. Lynes is the museum’s curator, co-curator of the “Abstraction” exhibit, director of the Research Center, and the author of “Georgia O’Keeffe and New Mexico: A Sense of Place”, among other books, which documents views and locations of O’Keeffe’s paintings and explores the compositional inventions (abstractions) in her so-called representational paintings. Ms. Lynes pointed me towards some leads for research on O’Keeffe and music, which I’ll be discussing in a future blog entry dedicated to the topic. We left Santa Fe and continued toward Ghost Ranch, the location of O’Keeffe’s beloved summer home and studio, formerly a dude ranch and now a retreat and education center. As we approached Ghost Ranch, we suddenly came upon epic vistas of red-orange cliffs and rolling tree-dotted hills, always with Cerro Pedernal (which O’Keeffe called her “private mountain”) looming in the distance. We were treated to a spectacular view of the sunset reflected on the cliffs outside our lodgings at Ghost Ranch. All of this, of course, was captured on film. 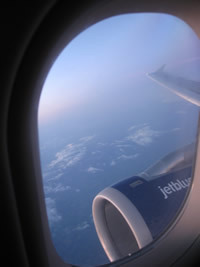 After a long day of travel, we finally got into to Denver late last night. 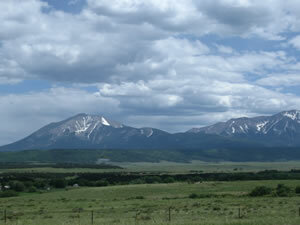 We spent the better part of the day driving to Taos, seeing some impressive snow-capped peaks along the way. This evening we are staying at the Mabel Dodge Luhan House, which housed many great artists and writers in the past. Georgia O’Keeffe stayed there in the summer of 1929 on an early formative trip to New Mexico. On the drive to Taos, we passed through San Cristobal and we spotted a roadside sign for the D.H. Lawrence Ranch, where Lawrence lived and wrote for two years. O’Keeffe painted a well-known depiction of a tree located on the ranch (“The Lawrence Tree”). 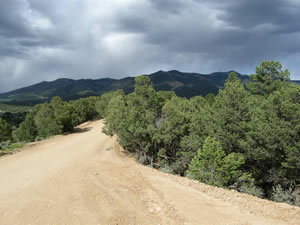 We started to venture down the dirt road heading toward the ranch, but decided not to make the full trip due to limitations of time. There was a mountain vista on that road, however, which begged to become the first real film shoot of this trip. Although I wasn’t quite yet in O’Keeffe’s home territory, it felt right, and I would bet that she liked that place. 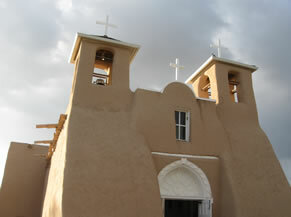 After this spontaneous side-trip, we continued through Taos and further south into Ranchos de Taos to film the famous San Francisco de Asis church (aka St. Francis church). This structure has been well loved by American artists and photographers, including Ansel Adams, Paul Strand, and of course, Georgia O’Keeffe. I was surprised to find the church smack dab in the middle of a parking lot, making it difficult to get a good wide-shot, but the golden sunset light was exactly what I had been hoping to catch. It was energizing to finally see and film this compelling building. Tomorrow it’s off to Santa Fe to the Georgia O’Keeffe Museum, and tomorrow evening… Ghost Ranch! Among other things, I created this blog in order to document a project that I will be working on over the next several months: a music/animation/video piece inspired by the life and work of painter Georgia O’Keeffe and her relationship to New Mexico and the American southwest. I’m honored to have been awarded an Entrepreneurial Grant from the New England Conservatory Entrepreneurial Musicianship Department to help fund this project. NEC President Tony Woodcock will be my project advisor. During the last year, I’ve composed an orchestral tone poem (“From the Faraway Nearby”) and two chamber pieces (“Into nowhere” and “To Create One’s Own World”) inspired by O’Keeffe’s paintings and her artistic sensibility. This video will allow me to delve more deeply into her compelling vision of the southwestern landscape, and will present my music in a new medium (specifically, the first movement of my chamber ensemble piece “Into nowhere”, which I’m using as the score to the video). I aim to explore the expressive possibilities of the intersection of visual and musical art, combining stylistic elements of music video, musical tone poem, animation, and documentary film. I will be traveling in northern New Mexico during the next two weeks to visit, research and film of some of the sites in which O’Keeffe immersed herself. 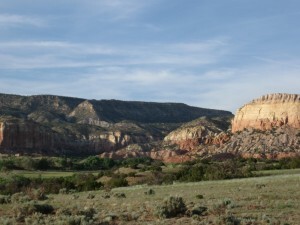 On the itinerary: Ghost Ranch, where she lived and where many of the views she painted still exist; various other sites in and around Abiquiu and Taos, including San Francisco de Asis Church in Ranchos de Taos and the mysterious “Black Place” northwest of Ghost Ranch; and the Georgia O’Keeffe Museum in Santa Fe, which is hosting an exhibit of her abstract works. Stay tuned for entries including photos and videos of my pilgrimage into the heart of “O’Keeffe Country”! UPDATE: The video is finished! See below for a summary of entries covering the filming, editing, premiere performance and other topics related to this project.